The main goal of JEBUPOR is comprise a scientific platform for academics who desire to share their knowledge, notions, findings and researches with colleagues while contributing in the named disciplines in national and international level. JEBUPOR, a scientific peer reviewed one, at least three times in a year, February, June and October since 2016. Applied, institutional, theoretical works along with analysis and definitive, qualitative and quantitative researches in relation to Economics, Business and Management disciplines could take places in the journal. Mission: Mediating the sharing of scientific studies. Vision: To be a respected journal around the world. Core Values: Publishing articles without compromising science. JEBUPOR is an international peer reviewed journal and publish three times in a year in February, June and October. JEBUPOR does not charge any article submission or article processing charges (APC). All expenses of the journal are covered by the JEBUPOR's editors. 1. JEBUPOR is an international peer reviewed journal and publish three times in a year in February, June and October . 2. Scientific and original articles which have directly or indirectly relation with economics, business administration, public administration, public finance, econometrics, labor economics, law and politics can be sent to the Journal. 3. The articles sent to the Journal should not be published in any other source or should not be offered to be published. 4. Articles should be written in Turkish or English. 6. Having too many spelling errors and failure to comply with the requirement of a scientific article will be sufficient for reversal. 8. In accordance with the evaluation reports from the referees, the possibilities of the outcome includes accepting & publishing the article, correction, or rejection. 9. The opinions in the articles published in the Journal are not the opinions of the Journal. All responsibility belongs to the author. 10. All rights of the articles published in the Journal are reserved and cannot be copied without the name of the Journal. 11. The Copyright fee is not paid in cash to the author of the article published in the Journal. 12. The articles which do not meet the publication principles will not be taken into the peer review process. Articles should be written in Turkish or English. The manuscripts submitted to the journal should have a plain and clear language quality and should be consistent with the scientific literature and language rules. Manuscripts should be written in a fluent language which is free of foreign words. JEBUPOR publishes only Original Research Articles. JEBUPOR provide an open access for its contents by believing it will increase the share of knowledge all around the world. JEBUPOR is an open access journal which means that all content is free availability on the public internet, permitting any users to read, download, copy, distribute, print, search, or link to the full texts of these articles, crawl them for indexing, pass them as data to software, or use them for any other lawful purpose, without financial, legal, or technical barriers other than those inseparable from gaining access to the internet itself. Written permission from the publisher to use the content for commercial purposes is required. The entire content issued by the journal including their supplemental material is always available for users free of charge (http://dergipark.gov.tr/iktisad/archive). * No payment is demanded from the authors for any kind of registration or review process. Personal information like names and e-mail addresses submitted to the JEBUPOR journal management system will be used exclusively for this journal's scientific aims. Such information will not be used for other purposes and will not be shared with third parties. All the high level data and full texts of the articles published in JEBUPOR are stored in PDF formats in a third party cloud server that is closed to access. Morover, all the articles are stored and published in PDF format on ULAKBİM servers via TÜBİTAK ULAKBİM National Databases. In accordance with its publishing policies, all articles sent to JEBUPOR will be scanned via iThenticate or Turnitin to get a similarity report before the article goes for review. The upper bound is determined as 15 percent. The matches found in each study after plagiarism detection are analysed in detail and those matches with correct reference and cross-reference are sorted. In the next step, the mistakes in the remaining matches are determined and reported to the editorial board. The board, then, makes a final decision in the light of the plagiarism detection report. The author(s) may be asked to correct the mistakes listed in the report or the study may be returned to the author(s). For the articles to be sent to The JEBUPOR, the authors are required to adhere to the following principles and rules. The articles which are not prepared in accordance with the principles and rules stated above may not be taken in assessment process, or may be excluded from assessment at any stage of this process. 1. Papers should be prepared with “Office Word” program and A4 format. 2. The length of the paper should not exceed 20 pages in journal format. 3. Page layout should be left: 2 cm, right: 2 cm, up: 2 cm, and bottom: 2 cm. 4. Articles should be written with font type of "Times New Roman", in 12 font size and with "single" spacing. There should be one space after points and commas. 5. Paragraphs should be without an initial indent, 6 nk spaces should be left between the paragraphs. No extra blank lines between the paragraphs. 6. The title should be written in Turkish and English with 14 font size, Turkish and English abstracts should contain no more than 200 words with 11 font size, and include 3 to 5 keywords in Turkish and English. 7. The name, surname, and title of the author(s) should be written with 12 font size, under the title and right aligned. The name of institution and e-mail address of the author(s) should be written with font size 10 in the footnote. 8. The headings and subheadings should be appeared in 12 font size, bold and left justified (unindented) and also numbered as 1. 1.1., 1.1.1., 1.1.2., 1.1.2.1. The headings should be capitalized and subheadings should appear in lower case (initial word capitalized). The headings should be partitioned no more than 4 levels. There should be one blank line before the subheadings; no blank line should be given after the subheadings. There should be no blank line before and after the subheadings. 9. All the tables, figures and graphics in the paper should be cited in numerical order and center aligned. Each table, figures, and graphics should be given a title. Table title should be placed above the table, figure, and graphics, with 10 pt, centered aligned, and only initial letters capitalized. Table, figure, and graphic text should be no smaller than 9 pt and no larger than 11 pt. All tables, figures, and graphics should be clear and can be easily readable and also compatible with the page layout. · Works by multiple authors: (Paksoy vd., 2014:35). · Paksoy (2013a), Paksoy (2013b). 14. For the cases not mentioned in spelling, scientific publication rules will be taken into consideration. The manuscripts submitted to JEBUPOR for publication should be original studies that were not published before or not submitted to anywhere else for publication. The right to publish the study on personal websites or open archive of their university on condition that the copyright details are provided. All the articles published in JEBUPOR are licensed under a Creative Commons Attribution-NonCommercial 4.0 International License. BY: Attribution - You must give appropriate credit, provide a link to the license, and indicate if changes were made. You may do so in any reasonable manner, but not in any way that suggests the licensor endorses you or your use. NC: NonCommercial - You may not use the material for commercial purposes. This license entitles all parties to copy, share and redistribute all the articles, data sets, figures and supplementary files published in this journal in data mining, search engines, web sites, blogs and other digital platforms under the condition of providing references. Open access is an apporach that eases the interdisciplinary communication and encourages cooperation among different disciplines. JEBUPOR, therefore, contributes to its own field by providing more access to its articles and a more transparent review process. The manuscripts pre-reviewed by the editors in terms of the aims and scope, and the “Publication Rules” section of the journal, are sent to at least two reviewers for a double blind-peer review process. The double blind peer-review process necessitates concealing the information of the authors from the reviewers and the other way round. The review results are secret and kept for a period of five years. The manuscripts declined in the review process are neither published nor returned to the author(s). The journal refuses to have any legal or administrative responsibility as to this abovementioned procedure. The manuscripts requiring revisions, on the other hand, are sent back to their authors for further changes. It is obligatory that the authors take the demands and the advices of both the reviewers and the editors. However, they are free to submit their objections against the issues they do not agree upon and the decisions of the reviewers on condition that they submit their reasonable grounds. In such cases a third-party reviewer is appealed. Also, a third-party reviewer is appealed for cases where the decisions of two reviewers are mutually exclusive. It is the responsibility of the authors to make their required revisions before their deadlines for re-submission. The editors are authorized to make minor revisions in accordance with the indexing criteria except for those which require substantial changes relevant to the scientific content. 1- The submitted articles are evaluated by the editor and / or members of the editorial board in terms of purpose, scope, method and writing principles. Two referees are appointed by journal editors to evaluate the paper just after the pre-check phase. 2- Accepted papers which are appropriate to the principals of publication and writing rules, are sent to two judges, recognized by their work and research area, without specifying the author's name. 3- In general, there is a time for the referee to accept the refereeing duty within a period of 15 days. The referee who accepts the duty will be given 30 days to evaluate the paper. Besides this general case, uploading the paper to the system would expedite the process of evaluating. 4- When two referees report that the paper is “Not Appropriate for Publishing”, the article is not published in the journal. 5- If one of the referees has a positive opinion about the publication of the while the other referee has a negative opinion, the article will be sent to the third referee; The publication’s sequel depends on the third referee’s report. 6- Whether the papers are published or not, they are non-returnable. The authors are required to consider the criticism and recommendations of the referees regarding the article they submit if they are asked to correct it. 7- The author is responsible for delivering the corrected text within the specified time. The revised text may be reviewed again by the referees in case of need. Neither referees’ nor authors’ identities are shared with each other (Blind Review). Referee reports are archived to be kept. If the author(s) finds a mistake in their study which is unpublished or in early release or review process, they are obliged to cooperate with the editor of the journal during the withdrawal process. 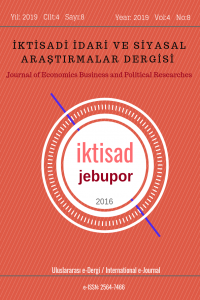 The author(s) who wants to withdraw their study which is in review process is obliged to fill in the "Article Withdrawal Form", scan it with signature(s) on it and send the form via e-mail to the editorial board at iktisaddergisi@gmail.com. The editorial board will return to the author(s) within a week, evaluating the request for withdrawal. The studies the copyright of which is transferred to JEBUPOR during the submission process cannot be submitted to other journals for review unless they are approved for withdrawal. The editorial board of JEBUPOR holds the responsibility of starting an investigation about a study if a suspicion arises that the study includes plagiarism and/or it has copyright issues. If the editorial board detects breach of copyright or plagiarism for the manuscripts in review process, they retract the study from review and cancel its review process by sending a detailed document to the author(s) showing what was detected and where in the study. The study which is detected to have plagiarism is labelled as "Retraction:" in the electronic environment. Instead of the Abstract and Full Text, the reasons why the study has been retracted, detailed evidence and the statements (if any) of the affiliated institution about the issue are published electronically. The study is announced as "Retraction" on the main page of the journal's web page. The study is included in the contents of the first issue of the journal to be published after the date of retraction as "Retraction: Article Title", and from its first page onwards the reasons why it has been retracted and the original citations are shared with the public and researchers. The institutions that the author(s) is affiliated with are informed about the retraction. The retraction reports indicated above are sent to the institutions where the journal is indexed so that they are recorded in index directories and catalogues. Furthermore, if there are any publishers or editorial boards through whom the author(s) had their studies published before, the editorial board of JEBUPOR can make suggestions to these parties that the published studies of the author(s) who has plagiarised should be reviewed for validity and reliability or be retracted. The author(s) retains the right to appeal against the reports produced by the editorial and scientific boards upon the completion of the review process at JEBUPOR. The author(s) should send their reasons for appeal in a scientific manner and by showing references to iktisaddergisi@gmail.com The appeal will be examined by the editorial board within one month the latest (the field editor and reviewers of the manuscript may be asked to share their opinions about the appeal) and the author(s) will be informed of any positive or negative result. If the result is positive, the editorial board assigns new reviewers that have expertise in the subject of the manuscript and re-starts the review process. The publication process at İKTİSAD is the basis of the improvement and dissemination of information objectively and respectfully. Therefore, the procedures in this process improves the quality of the studies. Peer-reviewed studies are the ones that support and materialize the scientific method. At this point, it is of utmost importance that all parties included in the publication process (authors, readers and researchers, publisher, reviewers and editors) comply with the standards of ethical considerations. JEBUPOR expects all parties to hold the following ethical responsibilities. Authors cannot submit their studies to multiple journals simultaneously. Each submission can be made only after the previous one is completed. A study published in another journal cannot be submitted to JEBUPOR. The editor and field editors of JEBUPOR should hold the following ethical responsibilities that are based on the guides "COPE Code of Conduct and Best Practice Guidelines for Journal Editors" and "COPE Best Practice Guidelines for Journal Editors" published as open Access by Committee on Publication Ethics (COPE). Being transparent and clear in issues that require correction or explanation. Editors must make decisions taking into consideration the knowledge, skills and expectations of all readers, researchers and practitioners need. They must also ensure that the published studies contribute to literature and be original. Moreover, they must take notice of the feedback received from researchers and practitioners and provide explanatory and informative feedback. Editors must make positive or negative decisions about the studies' importance, originality, validity, clarity in wording and suitability with the journal's aims and objectives. Editors must accept the studies that are within the scope of publication into pre review process unless there are serious problems with the study. Editors must not ignore positive suggestions made by reviewers unless there are serious problems with the study. New editors, unless there are serious issues, must not change the previous editor's decisions about the studies. "Blind Review and Review Process" must be published and editors must prevent possible diversions in the defined processes. Editors must publish an "Author's Guide" that is comprehensive enough in answering queries by authors. This guide must be updated regularly. Authors should be provided with explanatory and informative feedback. choose reviewers according to the subject of the study. provide the information and guidance reviewers may need during the review process. observe whether there are conflicting interests between reviewers and authors. keep the identities of reviewers confidential in blind review. encourage the reviewers to review the manuscript in an unbiased, scientific and objective tone. evaluate reviewers regularly based on criteria like performance and timing. develop practices and policies that increase the performance of reviewers. take necessary steps to update the reviewer pool dynamically. prevent unkind and unscientific reviews. make effort to ensure the reviewer pool has a wide range. Editors must make sure that the members of the editorial board follow the procedures in accordance with the publication policies and guidelines, and must inform the members about the publication policies and developments. The editors must also train new members of the editorial board and provide the information they need. ensure that the members of the editorial board review the manuscripts in an unbiased and independent manner. select the new members of the editorial board from those who can contribute to the journal and are qualified enough. send manuscripts for review based on the subject of expertise of the editorial board members. regularly communicate with the editorial board. arrange regular meetings with the editorial board for the development of publication policies and the journal. The relationship between the editors and publisher is based on the principle of the independency of editors. All the decisions made by the editors are independent of the publisher and the owner of the journal as required by the agreement made between editors and publisher. Editors are obliged to comply with the policies of "Blind Review and Review Process" stated in the journal's publication policies. Therefore, the editors ensure that each manuscript is reviewed in an unbiased, fair and timely manner. Editors must make sure that articles in the journal are published in accordance with the publication policies of the journal and international standards. Editors are supposed to protect the personal information related with the subjects or visuals in the studies being reviewed, and to reject the study if there is no documentation of the subjects' consent. Furthermore, editors are supposed to protect the personal information of the authors, reviewers and readers. Editors are supposed to protect human and animal rights in the studies being reviewed and must reject the experimental studies which do not have ethical and related committee’s approval about the population given in such studies. Editors are supposed to take precautions against possible abuse and malpractice. They must conduct investigations meticulously and objectively in determining and evaluating complaints about such situations. They must also share the results of the investigation. Editors must make sure that the mistakes, inconsistencies or misdirections in studies are corrected quickly. pay attention to the convincing criticism about studies published in the journal and must have a constructive attitude towards such criticism. grant the right of reply to the author(s) of the criticized study. not ignore or exclude the study that include negative results. Editors must examine the complaints from authors, reviewers or readers and respond to them in an explanatory and enlightening manner. Neither the owner of the journal, publisher or any other political or economical factor can influence the independent decision taking of the editors. The fact that all manuscripts are reviewed through "Blind Review" has a direct influence on the publication quality. This process ensures confidentiality by objective and independent review. The review process at JEBUPOR is carried out on the principle of double blind review. Reviewers do not contact the authors directly, and the reviews and comments are conveyed through the journal management system. In this process, the reviewer views on the evaluation forms and full texts are assigned to the author(s) by the editor. agree to review only in their subject of expertise. review in an unbiased and confidential manner. inform the editor of the journal if they think that they encounter conflict of interests and decline to review the manuscript during the review process. dispose the manuscripts they have reviewed in accordance with the principle of confidentiality after the review process. Reviewers can use the final versions of the manuscripts they have reviewed only after publication. review the manuscript objectively and only in terms of its content and ensure that nationality, gender, religious and political beliefs, and economic apprehension do not influence the review. review the manuscript in a constructive and kind tone, avoid making personal comments including hostility, slander and insult. review the manuscript they have agreed to review on time and in accordance with the ethical rules stated above. Editors are responsible for all the processes that the manuscripts submitted to JEBUPOR will go through. Within this framework, ignoring the economic or political interests, the decision-makers are the editors. The publisher undertakes to have an independent editorial decision made. The publisher protects the intellectual property rights of all the articles published in JEBUPOR and holds the responsibility to keep a record of each unpublished article. The publisher bears all the responsibility to take the precautions against scientific abuse, fraud and plagiarism. At JEBUPOR, the accepted manuscripts undergo the processes of preparation of bibliography, cross-reference and reference check, layout and galley, assigning a DOI number and being put into early release. The manuscripts in early release are published in the volume and issue determined by the editorial board. Since JEBUPOR claims no fees for article review or printing and no subscription fees for access to articles, it has no source of income. However, the following pecuniary obligations of the accepted manuscripts lie with the author(s). Scientific research builds upon previous studies. In new studies, references and attributions to the previous studies are provided within the framework of certain rules. Intentional or unintentional mistakes in scientific studies harm the reliability of the study and publication. JEBUPOR, in accordance with its publication ethics, considers it to be an obligation for the accepted studies to have correct and complete references and attributions. Therefore, each study, after acceptance, is checked in terms of bibliography, referencing and attribution by a company chosen by the editorial board. Incurring costs lie with the author(s). Bibliography is prepared according to the APA Referencing Style Guide 6th Edition. The in-text references of the references given in the bibliography should be in line with rules and regulations, and mistakes are corrected. Attributions of the in-text references are checked. The author(s) is asked to provide the missing ones, and the incorrect ones are corrected. For the Turkish full text Turkish rules and regulations of referencing are used, and for the English full texts English rules and regulations of referencing are used. JEBUPOR requires that the articles be printed in a common type of and complete page layout for formal integrity, readability and standards. Therefore, the studies whose bibliography preparation is finished, are sent to a company chosen by the editorial board for layout and galley. Incurring costs for page layout and preparation of the copy for print lie with the author(s). Digital Object Identifier (DOI) is a unique access number that enables the identification and accessibility of each article published electronically. It is mandatory that each article published in JEBUPOR or in early release is assigned a DOI number. After acceptance, the manuscripts which are checked for bibliography and ready for publication are given a DOI number by the Editorial Board. JEBUPOR values the dissemination of up-to-date and original information. Therefore, those manuscripts that are accepted after the review process and whose process for publication is over are published electronically as early release. Later, these manuscripts are given page numbers and published in the volume and issue found suitable by the editorial board. The manuscripts in the early release may not be the final version to be seen in the normal issue. Minor editing may be done on the final version to be published. In cases where manuscripts by authors whose native language is not Turkish are accepted for publication, the manuscripts should be submitted to the editorial board after their translation and editing is done by the companies indicated below. The language (Turkish and English) of the manuscripts submitted to JEBUPOR must be accurate in terms of rules of grammar and scientific literature and must have a plain and clear language quality. Manuscripts should be written in fluent language and free of foreign words. If the manuscripts are edited before they are submitted for review, the process of publication gets healthy. The editorial board may demand that the manuscripts be edited for language mistakes during the review process or after acception. The author(s) who has been requested to get his/her manuscript edited must do so referring to one of the companies below and present a related document to the editorial board afterwards.